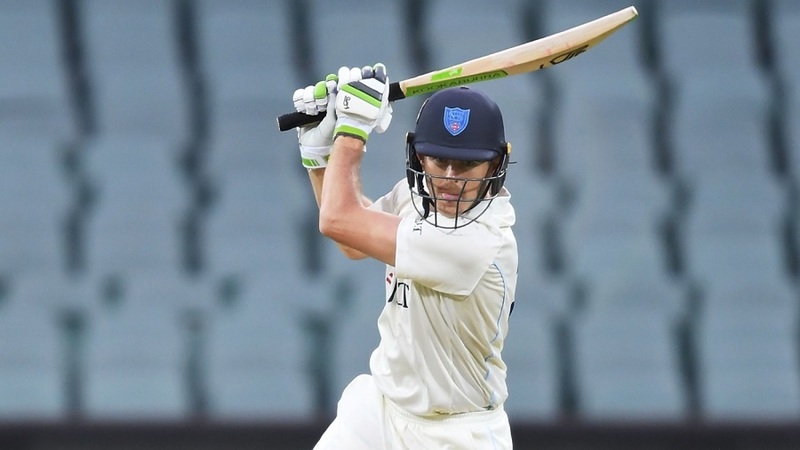 Half-centuries from New South Wales openers Daniel Hughes and Nick Larkin helped the Blues push beyond 300 on a vital opening day against Tasmania in Hobart. Needing a victory to all-but assure a spot in the Shield final against Victoria the Blues were sent in on a Bellerive pitch that has been brutally tough to bat first on all season, but Hughes and Larkin weathered the incessant swing and seam movement to post a 99-run opening partnership. Hughes was particularly fluent, striking 11 boundaries as he passed 50 for the sixth time this season. He fell to an incredible reflex catch from Matthew Wade at first slip. Hughes edged a ball off the back foot from Jackson Bird straight to Alex Doolan at second slip, Doolan spilt the chance but Wade’s stunning reflexes scooped the rebound inches above the turf. Larkin’s vigil last much longer. He absorbed 153 balls for his 67 and lost his stand-in skipper Kurtis Patterson in the process before he guided an outside edge straight to Doolan at second slip off Simon Milenko. The allrounder also picked Moises Henriques in the same spell before Bird returned to remove debutant Nick Bertus to leave the Blues vulnerable at 5 for 189. But youngsters Jason Sangha and Jack Edwards steadied with a 74-run stand before both fell to the second new ball. Sangha was trapped lbw by Bird for a patient 37 to give him three wickets for the day and do his Ashes hopes no harm. Edwards struck six boundaries in a brisk 44 before edging Riley Meredith to first slip. That would be Tasmania’s last wicket of the day as debutant wicketkeeper Baxter Holt and Trent Copeland added an unbeaten 46 in less than 10 overs to take the Blues past 300 at stumps. Copeland reached 30 not out from just 31 balls with five boundaries and will have a licence to press further on day two.